Follow your Deity: Choose to follow your preferred deities like Lord Ganesh, Shiva, Krishna and many more and set festival date alerts for Indian festivals. Nearest temple: Locate and get directions to the closest Hindu Temples in your vicinity. Auspicious Timings: Now exact puja timings are just a click away. You can also set reminders for the Puja and be ready at the auspicious time. 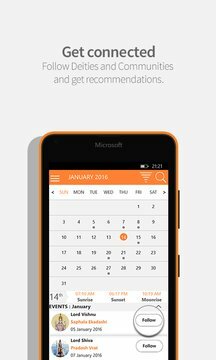 Notifications: Receive regular updates for all upcoming events and dates. 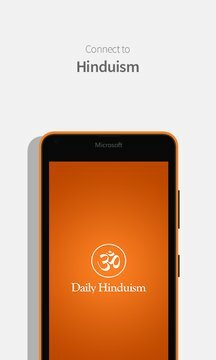 Hinduism Information: A Single App pertaining to various Deities and Communities of the Hindu faith. This one-stop destination provides information on the stories and beliefs of the rich Hindu faith with its various Communities, Cultures, Gods and Goddesses. Learn about rituals and traditions associated with celebrating Hindu festivals. Personalization: Follow your favorite Deity or community to customize app and get details of events related to your chosen Deity/Community. Social Sharing: Share your Deity/Community-Events and celebrate with your friends and relatives.